Comments: Every year we have been holding an event for children that are receiving treatment for childhood cancer(s). This event is a fun event for the Father's to bring their son(s) that are receiving treatment for fun times and to forget about the cancer treatments and hospitals and doctors. 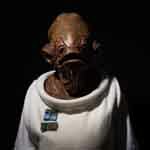 I'll be there as a Snowie on the 501st side- I'm saving Ackbar for the Smithsonian event in DC on Thursday. Bumping this post. This was a really great event to attend and regardless of costume we had 4 Freedom Base members present which is showing positive growth in the NoVA area outside of the major events!